This Christmastime, the best holiday treat onstage is much more than a dance; it’s a magic show spectacular where ballerinas, danseurs, and actors become illusionists. From a toymaker’s fingertips, a bouquet of flowers magically blooms from thin air, a wind up mechanical nutcracker doll become a valiant soldier prince, and a Christmas tree grows to gargantuan proportions. Audiences are first transported to the grand ballroom 1920s mansion styled in glorious Art Nouveau, the opulent style of the prewar “Golden Age.” The nutcracker valiantly defends the child’s delectable Holiday treats from the Rat King and his minions as everyone else slumbers on Christmas Eve. And then for the second act, audiences join that family’s little girl in traveling the world with an enchanted Sugar Plum Fairy who transforms Spanish chocolates into flamenco dancers, Arabian coffee into bellydancing princess and entourage, Chinese tea into silk garbed, Russian candy canes into twirling tartars, and French marzipans into country maidens. By far the most beguiling enchantment of all is a story well told with nary a word—a well-loved tale illustrated solely through classical dance and pantomime by seemingly supernatural ballerinas and danseurs. Always, there is the illusion of effortless and gravity-defying grace wrought with tortured sinews and unforgiving discipline. Audiences are none the wiser. For the kids, the ballet dancers are all smiles as they thrill, amaze, and delight. And for adults, it is to be filled with the wonder and awe of a child again for the length of a show. The Nutcracker, Ballet Philippines’ year end treat for the entire family, performs until December 10, 2017 at the Main Theatre of Cultural Centre of the Philippines. Dancing to the live orchestral music of Tchaikovsky performed by the ABS-CBN Philharmonic Orchestra under the baton of conductor Gerard Salonga on a set designed by the late National Artist for Theatre Salvador Bernal are Denise Parungao, Candice Adea, and Jemima Reyes alternating as the Sugar Plum Fairy. Partnered with them as the Nutcracker Prince is no less than Nobuo Fujino, former senior artist at the Australian Ballet and principal dancer with Hong Kong Ballet, with Lester Reguindin and Victor Maguad as alternates. Portraying the magical toymaker and uncle Don Alfonso are Butch Esperanza and Jonathan Tadioan. The Nutcracker—with libretto based on Alexander Dumas’ retelling of E. T. A. Hoffmann’s The Nutcracker and the Mouse King and score by Pyotr Ilyich Tchaikovsky—has had many versions and alternative endings through the centuries across the globe since it first premiered in Saint Petersburg, Russia in 1892. It has been Filipinized by Edna Vida and Alice Reyes, whose versions were premiered in 1987 and 1982, respectively. Here, the story is set in the 1920s at the palatial home of Don Rafael and Dona Aurora de Asis and their three children: Clara, Sonia, and Franco. As their household prepares for the Noche Buena feast, toymaker and godfather to the children Don Alfonso Rafael arrives. To Sonia he gives the Sugar Plum Fairy doll. To Franco, he gives the doll of the Rat King. And to his favourite Clara, he gives the enchanted Nutcracker Doll. At the stroke of midnight, the dolls come alive and a battle ensues between rodents led by the Rat King and toy soldiers led by the Nutcracker. At the verge of defeat, the Nutcracker is saved by Clara. Her act of pure heartedness releases his enchantment, revealing him as the Nutcracker Prince. She is rewarded by the Sugar Plum Fairy who takes her to the Kingdom of the Dolls where their Christmastime treats come alive. From the onset, The Nutcracker enchants with Bernal’s tropicalized Art Nouveau designs that uses native anahaw palm leaves and capiz mother of pearl windows as a motif. 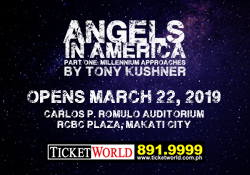 Even before dancers take to the stage, Gerard Salonga’s ABS-CBN Philharmonic Orchestra has audiences reeling in delight. And when the ballet dancers do take the stage, it is Ballet Philippines own Sugar Plum Fairy that shines brightest. On the Friday evening performance Denise Parugao was effervescent. She was was sweetness epitomised through both dance acting and expression. 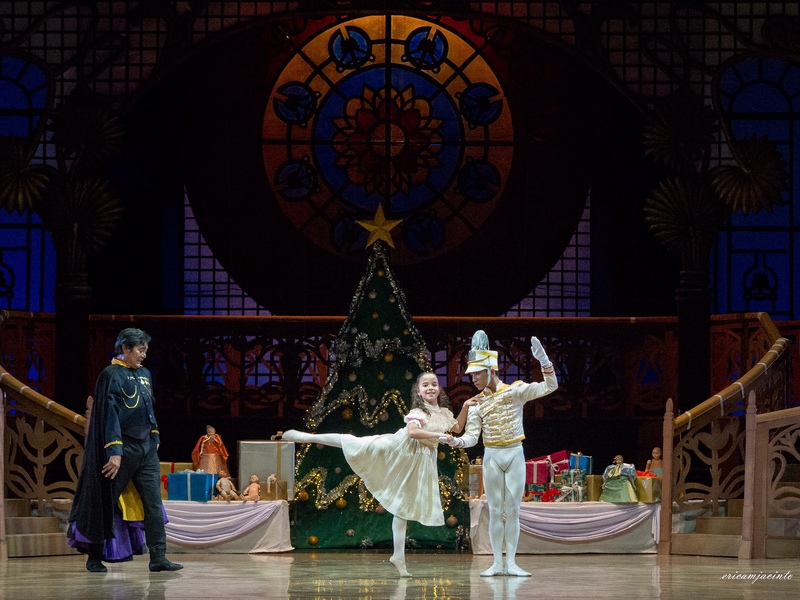 Guest artist Nobuo Fujino as the Nutcracker Prince shined with clockwork precision and form. Even those part of the cast who are not part of the ballet company—the rigodon de honor who play the parents and those that play their children—perfectly sync with ballet Philippines dancers in their prime. The rigodon de honor is comprised of senior members of Ballet Philippines alumni and the party children are comprised of students of various ballet schools. Butch Esperanza, a Ballet Philippines alumnus, convincingly transformed into a master illusionist for his role as Don Alfonso Rafael. The Nutcracker was a perfect marriage of a well-crafted material and well-honed performers. The only possible sore point was the retention of original Nutcracker’s stereotypical portrayal of Chinese. Having successfully adapted the material to Philippine culture, such racial stereotypes beg to to be replaced with more accurate portrayals that pay proper tribute to Asian culture. The Nutcracker is a children treat for the Holidays. And even the grumpiest Scrooge can’t help but find his inner child with this delightful show of magic and dance. Writer, graphic designer, and business owner Rome Jorge is passionate about the arts. Formerly the Editor-in-Chief of asianTraveler Magazine, Lifestyle Editor of The Manila Times, and cover story writer for MEGA and Lifestyle Asia Magazines, and associate editor of adobo magazine, Rome Jorge has also covered terror attacks, military mutinies, and mass demonstrations as well as reproductive health, gender equality, climate change, HIV/AIDS and other important issues. He is also the proprietor of Strawberry Jams Music Studio.